A few years ago at a heated public meeting, one of Barnt Green’s traders warned that planned changes to the centre of the village would “pull the plug” on its shops. Well, the bollards and planters are in place – and mostly accomplishing their purpose of keeping vehicles off the pavement – and the village appears to be thriving. Early afternoon on a wet Wednesday and you might expect the place to be quiet, but no, shoppers and villagers are milling around making the most of what has developed into an eclectic mix of shops along the high street. The past year has seen an influx of new names, including recent arrivals Eye Opticians, It’s A Gift and The Locker Room. This latter – offering sportswear, workwear and school uniforms – is one of a rare breed in town or village centres, with many people having to travel further afield to find this type of shop, according to owner Charles Millinchip. The Locker Room allows customers to have their name, logo or insignia embroidered on to a large range of garments, and is a stockist of uniforms and sports kit for a number of local schools and pre-schools. The shop also specialises in ladies’ football kits, and has been asked to supply various teams and clubs such as Bromsgrove Swimming Club and Barnt Green Scouts. Clients can also have names or messages engraved on a range of trophies – as with the clothing, the shop displays samples for customers to browse, with the opportunity to order from a vast catalogue. The Locker Room is an official supplier of Aston Villa merchandise, as well as selling scarves and mugs from other football clubs. If you visit the shop in the next few weeks, make sure you buy a ticket to be in with a chance of winning a shirt signed by Wayne Rooney – it’s being raffled in aid of Leukaemia Research, and the official draw is expected to take place during June. More relatively new faces include Style Council, Barnt Greens, Longfords Furniture and the Magic Moments nursery, while several businesses – such as Peter’s Pan, the Victoria Inn and the Deedar restaurant – have undergone major refurbishments. There have also been a few other changes in the village, with Deli & Cafe on the Green changing hands, and Victoria Travel cruising off to a new home in Redditch. That particular gap was soon filled by renowned Barnt Green hair stylist Michelle Griffin, who has established her new academy on the premises, and clients can also visit the Nikki Jarvis beauty salon on the upper floor. This year also saw the departure of Lloyds Bank, amid rumours that the vacant building may become a restaurant and hopes that it could be offices for Barnt Green Parish Council. However, the worries that Tesco Express would kill off trade in the village appear to be unfounded – the new arrivals are a case in point, while a number of new online or home businesses such as Coast Interiors and Cherry Portraits have also been set up in the area, joining long-standing names like interior designer Mary Barber Fray. Established shops and businesses in Hewell Road are still drawing in plenty of local and not-so-local trade, with boutiques like Hollywood Collections, Continental Collextions and Joolz attracting customers from much further afield. 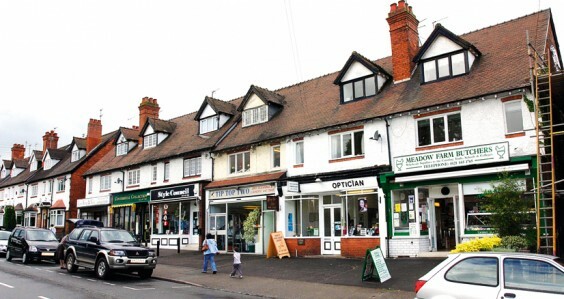 As well as attractive shops and eateries, visitors to Barnt Green will also discover a range of other services, from floristry (Oasis Flowers & Balloons) to physiotherapy (Kath Hamflett) and estate agents (Allan Morris & Peace) to DIY (Tony’s Handyman). And for a perfect introduction to everything this village has to offer, why not pop along to the Barnt Green Festival on June 23? This well-established and popular event draws most of the residents of Barnt Green into the village centre for a wealth of activities and events, and has also become quite an attraction for those living in the neighbouring villages. The village centre will be closed off for the afternoon and taken over by bands and dancing groups. There will be side stalls, refreshments, raffles and a balloon release at 6pm, while major highlights include the arrival of MP Julie Kirkbride by plane. The proceeds will be divided between local charities and a donation will be made to the Scout and Guide Hut Appeal.